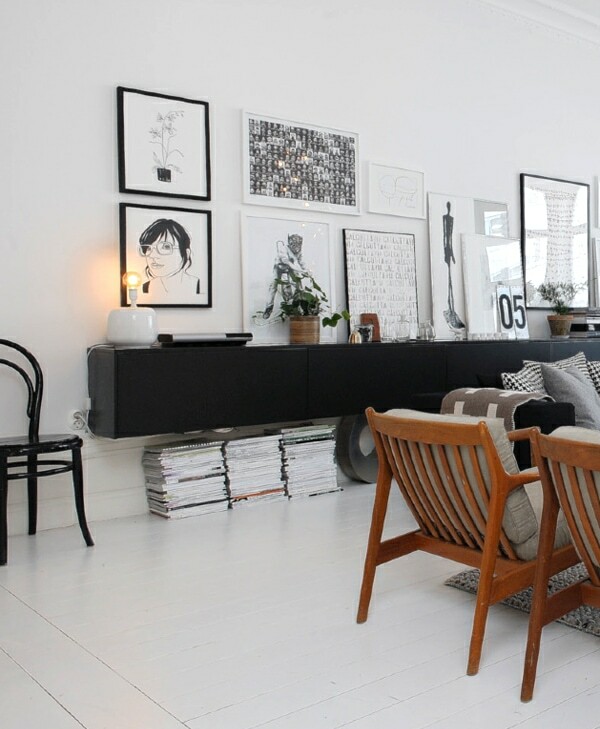 It’s been such a long time since I posted a round-up of white floors! After spending the weekend doing some serious spring-cleaning at my house (Did you see my to-do list, by the way? Almost everything got crossed off! ), I’m really feeling like I have to make the time to paint the second-story floors WHITE. They are so dingy, damaged and discolored, and they can’t be sanded down. I already painted the floor in the back room (uh, four years ago), and I meant to keep going into the other rooms, but I just…haven’t…gotten…to…it. 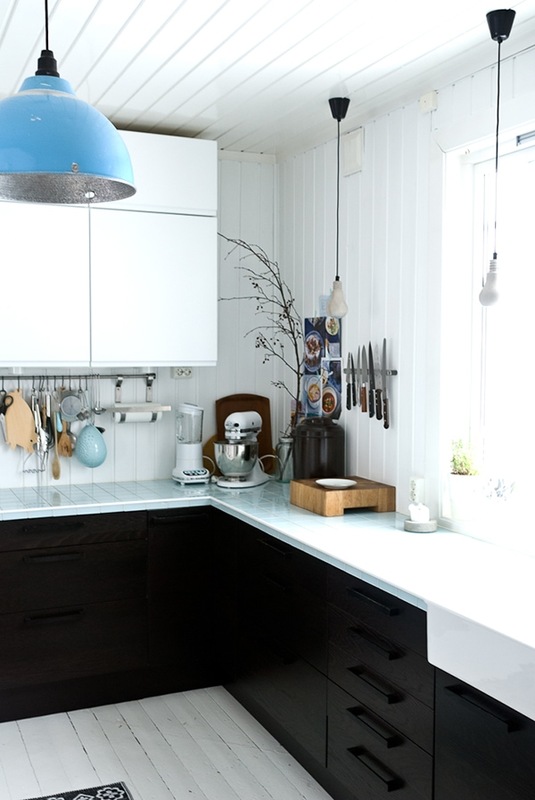 On a side note, how nice are those black cabinets? I love that the handles are the same color. Fjeldborg is such a pretty blog. Same room, two different angles. So peaceful. Everything about this space is perfect (I’d probably spoil it with a rug, though). 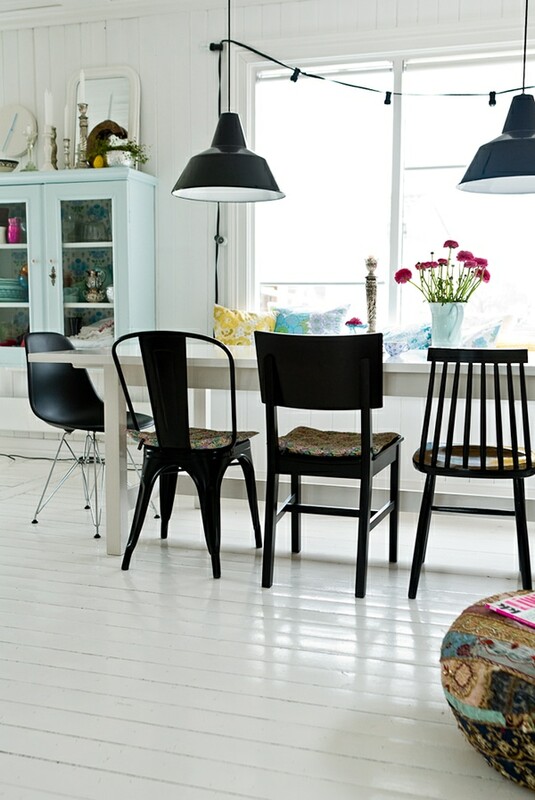 I especially love the side-by-side black & white Eames LTR tables. And what kind of tree is that? 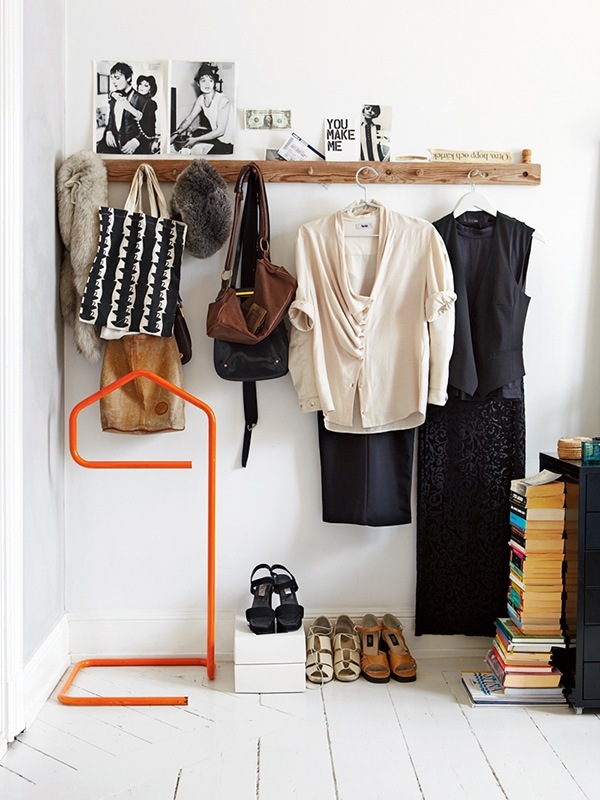 Can you believe this is a Swedish real estate photo of a home that was styled to be sold? Amazing. Not really the kind of thing you’d ever see on an episode of Sell This House. This reminds me of my bedroom at the house! Now imagine my bedroom minus the orange floor (that wood looks so much better in photos than it does in real life, seriously). SO MUCH BETTER. See how there are boards intersecting at a weird angle on this floor? No idea why it’s like that, but I love it. The upper-level floors in my house were put in at different times, and they’ll all arranged in different patterns/cut styles. I actually think that painting the floors white will make that more apparent, because the gaps between the boards would really show. Beautiful photos. I love the kitchen and the styled to sell one especially. Do yours! White floors are the best! I think that tree is an olive tree. I love the semicircular bay window with desk in that photo. yes, defo an olive tree. All these spaces = perfection. I just love how beautiful everything looks against pure white! looks like they’ve got a fauxdenza in there! You can definitely paint over linoleum (or vinyl), Samantha! There are tons of tutorials out there, so just start Googling and reading. With a light sanding, a good bonding primer (like Bullseye) and paint, you should be all good. I think its an olive tree too. Your apartment floors look super orange online, so I believe you when you say they are worse in real life. 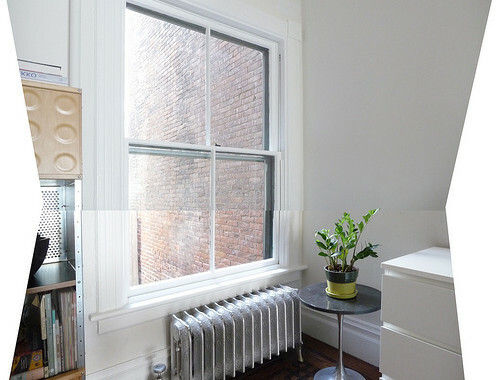 Also, that counter top and the weird nook under your bedroom windows! I hope the landlord starts trusting you soon so you can make it all better, Anna-style. They can’t be sanded down anymore because they’re too thin. They’re also face-nailed (not tongue and groove), so any type of refinishing — even buffing/screening — would be a nightmare. They’re just very worn out and badly damaged from 100 years of being walked on. The sun exposure in the front of the house has really done a number on them, too. I love white floors! I worry about them being too dirty, but I think it makes such a statement. I also like the idea of jazzing it up with a bold printed rug. We don’t wear shoes in the house, and we really never had a problem with our office floor looking dirty. Your blog posts about the upstairs back room are the reason we FINALLY decided to paint our floors white, and we couldn’t be happier. Thank you for the inspiration! We live on the ground floor of a brownstone, and since the change, we use so much less artificial light. The whole place feels bright and HUGE. We used Farrow and Ball only because I had it left over from a job I did, but I’m happy with it- no yellowing and super easy to wash.
Yeah, it must make the space feel so much brighter! Years ago I lived on the ground floor of a brownstone (door under the stairs, garden in the back), and it was very dark. White floors would’ve made a huge difference. 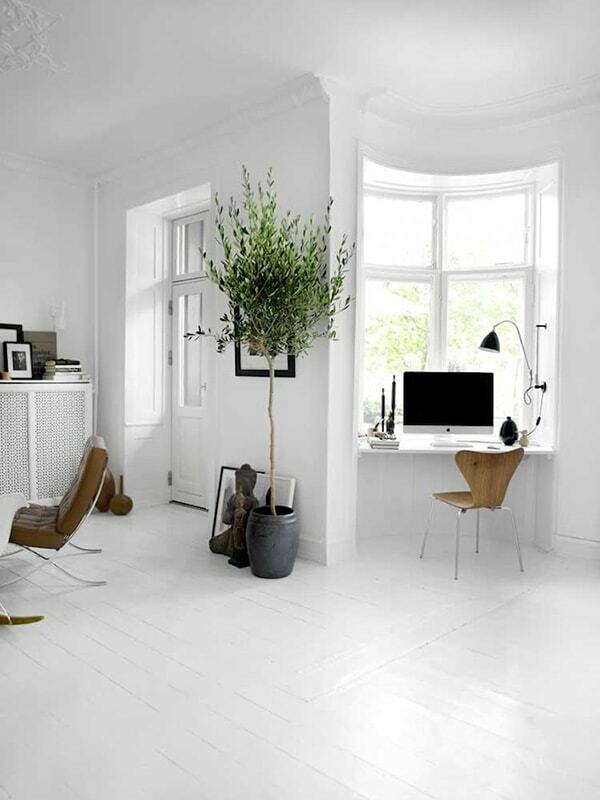 I have been NEEDING white floors for so long. Same situation, some of mine can’t be sanded and are in bad shape but…where to start? when to stop? how to convince dh? Upstairs would be logical choice (less traffic etc) but they would look so good in the kitchen, but but, dog nails, men in boots, but but but I waaaant them! Also, picture #2, those concrete light bulbs…again, NEED. Found them at “CARAVAN”, do you know of a US site for them? Thanks! My mother has those lights in her basement! They’re designed by Tove Adman. She bought them at a shop in upstate New York (Scandinavian Grace), but I just checked their site and they don’t carry them anymore. You can order them from Scandinavian Design Center, but I’m not sure how crazy the VAT would be. It’s worth checking, though! I must say, one of the nicest things about painted floors is that they actually look fine if they get chipped, and that they’re really easy to touch up if necessary. I use Benjamin Moore Porch & Patio paint when I did our studio floor (primed first with Bullseye), and that stuff is TOUGH. The finish is much more durable than regular wall/trim paint. We’re actually in the process of getting our dining room floor painted white (and finally finish the remodeling of it) so these are great to look at and perfect inspiration. The entire dining room is white and while the wooden floor is pretty, it just NEEDS that extra oomph of the white floors. To help the floor transition from dining room to living room, we’re having a patterned border painted where the dining room meets the living room. Thanks! Nah, it’s just two storage units pushed together. Love all these! I’ve been wanting to paint our upstairs floors white for awhile. They are a yellowish/orange wood right now too. I’m worried about how the paint will hold up with two big dogs, three cats, and a baby on the way. Anyone have any advice or experience for having painted floors with bigger dogs? Anna, how have the room you’ve done so far held up? I have NO experience with anything involving bigger dogs, but I can tell you that four years after painting our studio floors, they are still chip-free. The most I’ve had to do in terms of maintenance (aside from normal cleaning) is occasionally use a Magic Eraser to remove a scuff mark. My husband keeps all of his musical equipment in there, so there’s always something dragging across the floor or sitting in one spot with black rubber feet! Good call, Ella, I’ll bet you’re right. I have just removed the dirty cream/beige carpet from our hallway ( who on earth think cream carpet is the way to go for a hallway!). The floorboards underneath definitely need sanded but are in good condition. You might have just convinced me with the white, these photos are just so beautiful, I am getting quite excited about getting this project finished! Ordinarily, I’d prefer the look of the natural wood floors, but in your house I think the white painted floors would be stunning. You should definitely go for it. Of course, I say that as one who WON’T be doing the work. ( http://www.theaedis.com/2013/03/white-painted-floors-dream-continues.html ). I get inspired to do this every single year, but I’m never in a position to pull the trigger on it. My floors are in too good of a condition to convince my wife to let me try it. I think it would really bounce the light around in a great way. 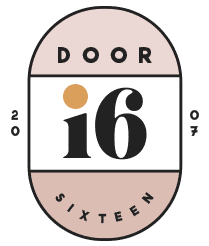 BTW, I just discovered Door Sixteen, and it looks like a have a lot of reading to do! Awesome. I think I prefer black floors though. That is my heart in a house, right there. Thank you! for posting these. 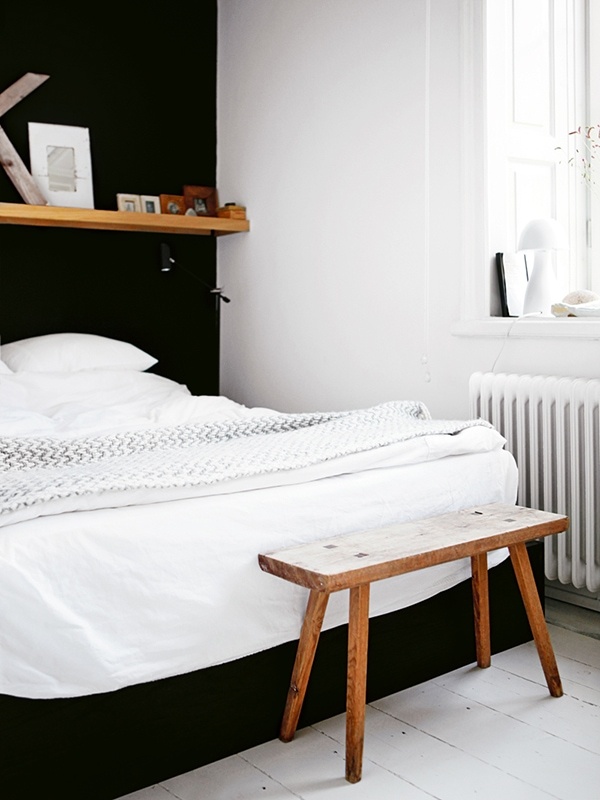 White floors will look amazing in your house. Do you by any chance know who makes the black string lights in the first image. They are fabulous! Anna, thanks for the information. I have been desperately trying to find them for a while. I am obsessed with string lights. I have the Patrick Townsend string light and various other cheapo string lights all over the house. I can’t wait to see your post on string lights. 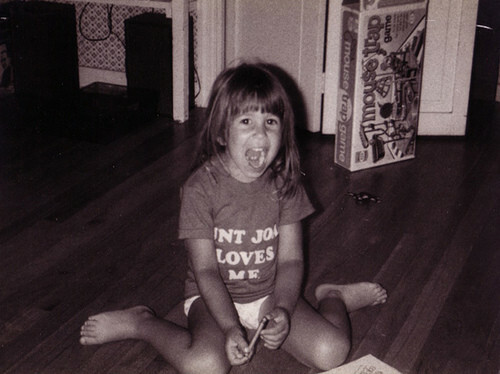 Googling white floors is what initially brought me to your blog, four years ago. Ironically, I have yet to paint my floor. I painted my apartment floors all white a few years ago. Actually, I was googling it beforehand and that is how I found your blog. I really love white floors too. It has opened up the space tremendously. I also painted all the walls and ceilings in the same color (but flat wall paint) because I live in a typical Manhattan apartment where nothing seemed to be squared when built and the floors have sloped with time. I just gave them a fresh new coat this month – a lot of moving everything to one side, painting and repeating, but well worth it. any idea where or what the bright orange standing coast rack is? i’m trying to type in all kinds of words and can’t come up with any matches. 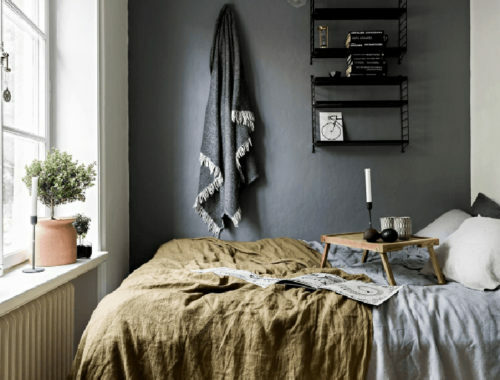 Annie, the article linked to in the credit under the photo states that it was purchased at a flea market in Copenhagen. Darn it. I did click the link but what I came across was in another language and I couldn’t figure it out. Thanks for responding so quickly.